It is a site that allows, every hour, to earn bitcoins with the faucet. Click on "claim again" and a number comes out that recognizes a certain number of coins. 100 coins equals 0.01 $. You can receive coins every hour. The characteristic of cointiply is precisely this: despite being a site that pays in bitcoins, it does not seem to be subject to changes in the value of this virtual currency. In fact, the payment can already take place upon reaching 35,000 coins ($ 3.50) and what will be paid will be the bitcoin equivalent of the coins or dollars earned and required for payment. For each day of cointiply use, a bonus is also awarded that comes from 1 (for the first day) to 100% on the one-hundredth day. 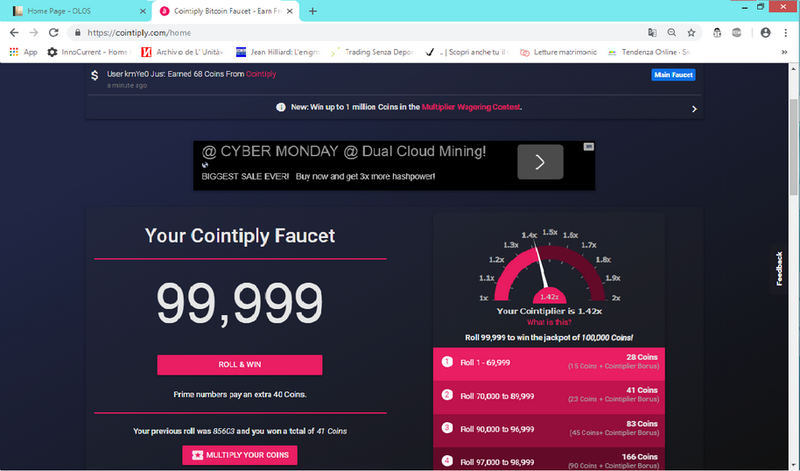 The bonus is calculated on the claim of the faucet and if you skip one day you start again. The other ways to earn money on cointyply are: watching ads, watching videos, responding to surveys, undermining bitcoins, and playing the coins earned. And, of course, have other people sign up, which will lead to a 25% gain on what is earned from their referrals.